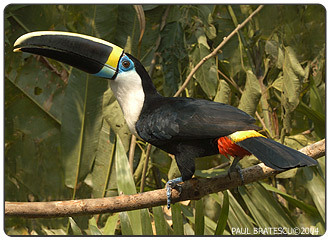 Cuvier’s Toucan (Ramphastos cuvieri) is similar in appearance to the Red Bill Toucan, and was once considered a subspecies of the Red Bill, but no longer. Sibley and Monroe classify it as a separate species. The principal difference between the two is found in the coloration of the sides of the beak. The Red Bill’s Beak is maroon red to light red on the side panels, whereas the same portions on the Cuvier’s beak is black. Both have similar yelping calls . The Cuvier’s toucan ranges from southeastern Colombia south through Eastern Ecuador and Peru into western Brasil and northern Bolivia. It coexists with the similar appearing Yellow Ridged Toucan (Ramphastos vitellinus culminatus), but is larger in size and has a longer bill. It is also distinguishable by its call. Whereas the Cuvier has a yelping call audible at great distance in the rainforest, the Yellow Ridged Toucan has a croaking call and is less noticeable. Cuvier’s are kept in captivity in Peru, where they are being bred and there a few in the U.S. at the present time. Their diet and housing requirements are identical with those for any other large toucan.